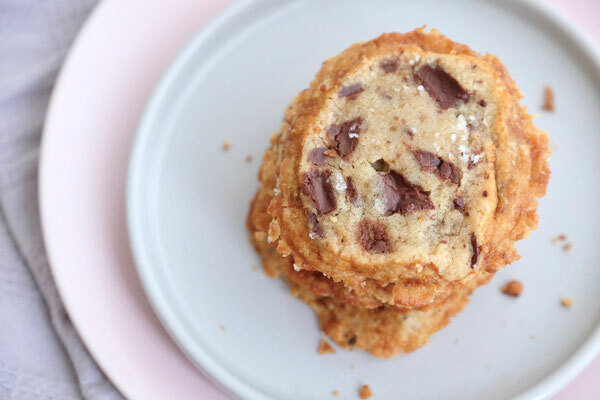 If you're an avid food blog reader like me, chances are you've stumbled upon these Salted Chocolate Chunk Shortbread Cookies by Alison Roman in the last months. I feel like they've been all over my favourite food blogs and they even became Instagram famous. No wonder, this shortbread-meets-chocolate chip cookies-meets-salted butter zombie cookie looks pretty great. 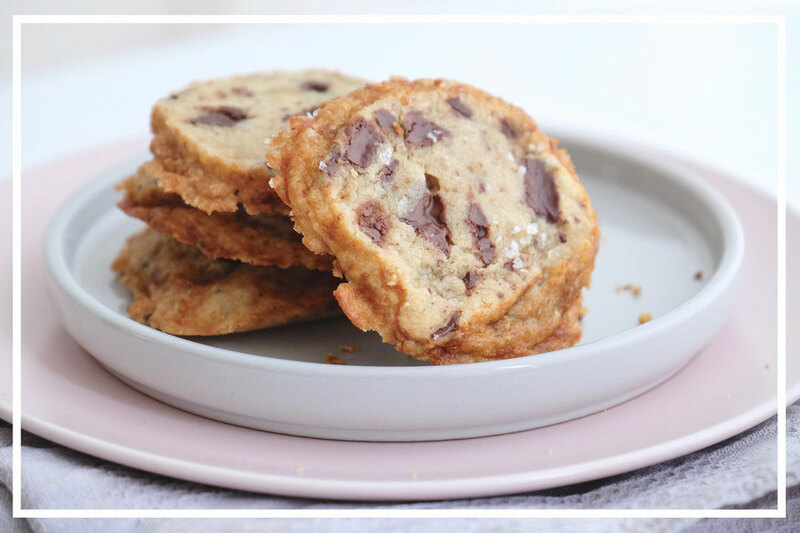 I mean, I don't know about you, but oozing chocolate chunks in cookies will get MY likes any day. And so my curiosity (and my sweet tooth) got the better off me and I knew I had to try those cookies. And even if they don't look as good as the ones on Instagram, I'm now officially a fan of the cookies and the author! For a brief moment I thought the universe was against me making these cookies, because the first ingredient I needed for making them was not available in my supermarket: salted butter. It's not necessarily a thing in Germany, so salted butter can be hard to find and I didn't want to substitute it for any other fat, as the butter is so crucial to the crumbly texture and the buttery taste of shortbread. But I also don't like to give up so easily, so I just used regular butter and added a ton of kosher salt (about half a teaspoon, but you can always add more or less). 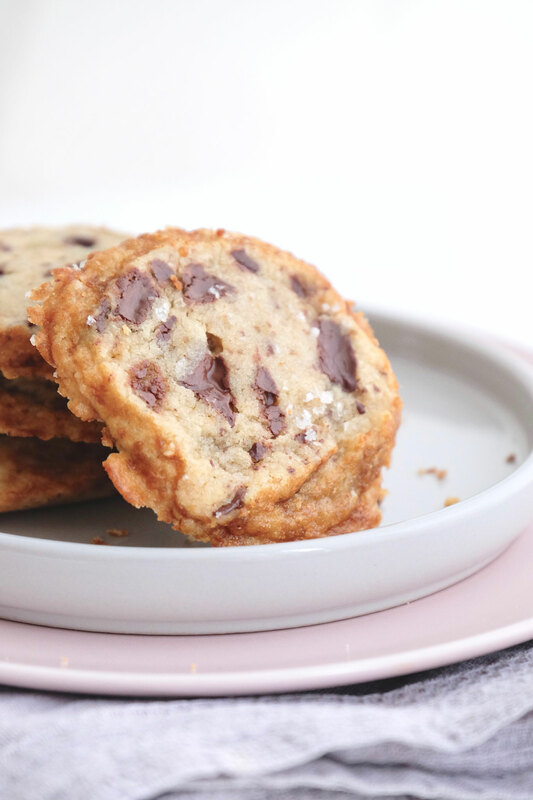 Definitely don't skimp on the flaky sea salt for the tops of the cookies though, as this addition takes this from being a solid chocolate chip cookie to being an amazing cookie that is strangely addictive. Trust me, I made both versions and I ate enough cookies to confidently make this statement. My cookies spread a little in the oven, which is probably due to uneven heat distribution. I know I should get an oven thermometer - but somehow I always forget. Alas, as with most baked goods, these cookies taste amazing, no matter what they look like. So, if there is anything I want to say today, it's this: Grab some (salted) butter, get in the kitchen, and make these cookies. Preparing the dough takes only about 15 minutes and even though you'll have to let them chill, it's so worth the wait. You could even prepare the dough a few days before and then bake the cookies off. Cookies in 15 minutes! Are you convinced yet? Use a stand mixer fitted with a whisk attachment or an electric hand mixer to cream together the cold butter with both types of sugars, until light and fluffy and well incorporated. That takes a few minutes. Scrape down the sides of the bowl every now and then so everything is well incorporated. Add the flour and the chocolate chunks and mix for about a minute, but only until you can't see any streaks of flour in the batter. The dough should be smooth. Divide the dough in half and place each halve on a big piece of plastic wrap. Using your hands to form each pile of dough into a log shape and wrap it in the plastic wrap. Now roll the log on the counter to smooth it out and make it even, but it doesn't have to be perfect. The log should be 2 to 2¼-inches in diameter. Chill in the fridge until firm, for about 2 hours. Preheat the oven to 175°C/350°F and line a baking sheet with parchment paper. Brush the two logs with the beaten egg (or milk) and roll them in the brown sugar to get a golden, crispy crust on the cookies. Use a serrated knife to slowly and evenly cut the logs into 0.5 inch thick round cookies. If you hit chocolate, use a sawing motion to slowly saw through the chocolate and if anything falls apart, just press it back together with your fingers. Place the cookies on the baking sheet, about one inch apart and sprinkle them generously with the flaky sea salt. Bake the cookies for 12-14 minutes, but take them out as soon as the edges are golden brown. They will set further when they cool down, so don't worry if they look underbaked. Take them out of the oven, let them rest for 10 minutes and transfer them to a cooling rack to cool completely.